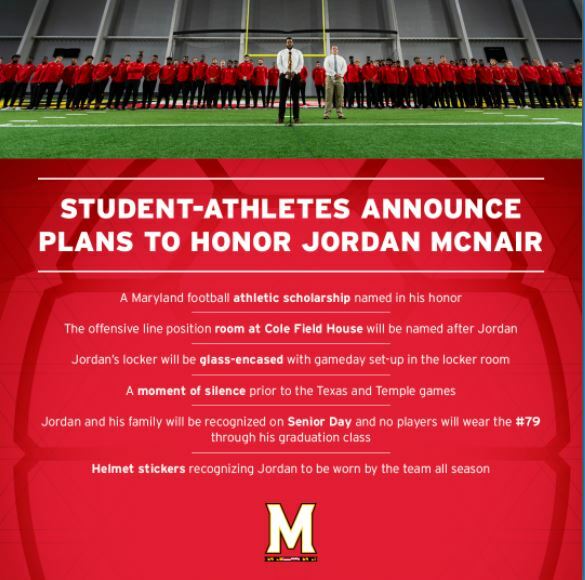 The Maryland Terrapins football team announced Monday its plans to honor Jordan McNair, redshirt-freshman offensive lineman who died after suffering from heat exhaustion during a May team workout. Maryland players told reporters the university’s football program will honor McNair by naming an athletic scholarship in his name, while also naming the offensive line position room after McNair at the team’s training facility in Cole Field House. The team will also glass encase McNair’s locker in gameday condition, and a moment of silence will be conducted before key games against University of Texas and Temple University. Helmets stickers recognizing Jordan will be worn on all players’ helmets, and no one will wear the 19-year-old Maryland native’s jersey number throughout the entire tenure of his graduating class. Jordan’s death led to the university placing head coach DJ Durkin on administrative leave, while terminating ties with strength-and-conditioning coach Rick Court. Maryland athletic director Damon Evans acknowledged that the team’s training staff made errors in how it treated Jordan, which ultimately led to his death. Evans emphasized that it was the training staff, not the coaching staff, which failed to properly follow its emergency response plan, which included cold immersion treatment to properly cool a heat stroke victim’s body temperature down. ESPN reported that Jordan’s body was at a temperature of 106 when he arrived at the hospital, which showed he was never cooled down. ESPN recently reported on an alleged “humiliating and intimidating culture” established under head coach Durkin’s watch. But some players came to his defense, saying he doesn’t deserve to lose his job.